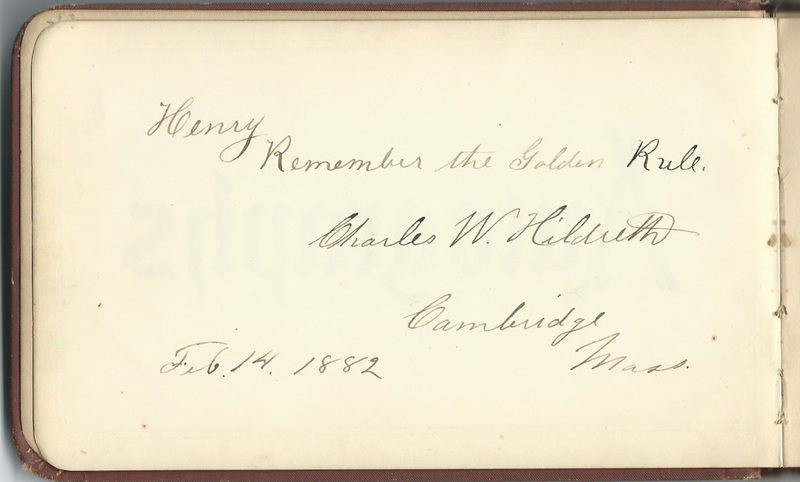 1881-1894 autograph album that Henry Willis Hildreth of Cambridge, Massachusetts, presumably received as a Christmas present in 1881. The album measures approximately 6-3/4" x 4-1/4" and contains the sentiments of over 40 of Henry's relatives and friends. An alphabetical surname list and an alphabetical list of the signers, together with any personal information they offered, appear at the end of this post. Most of the pages were signed by members of the extended Hildreth and Colburn families of Massachusetts and New Hampshire. Henry Willis Hildreth was born May 26, 1874 at New Ipswich, New Hampshire, the son of Charles Willis Hildreth and Lucy Maria (Colburn) Hildreth, who were born at New Ipswich, New Hampshire, and Temple, New Hampshire, respectively. Henry's parents inscribed facing pages in his album. Lucy Maria (Colburn) Hildreth's parents were Nathan Colburn and Jane (Parker) Colburn. Jane signed a page as "Grandma" on September 15, 1882. Her husband Nathan had died earlier that year, on January 23. 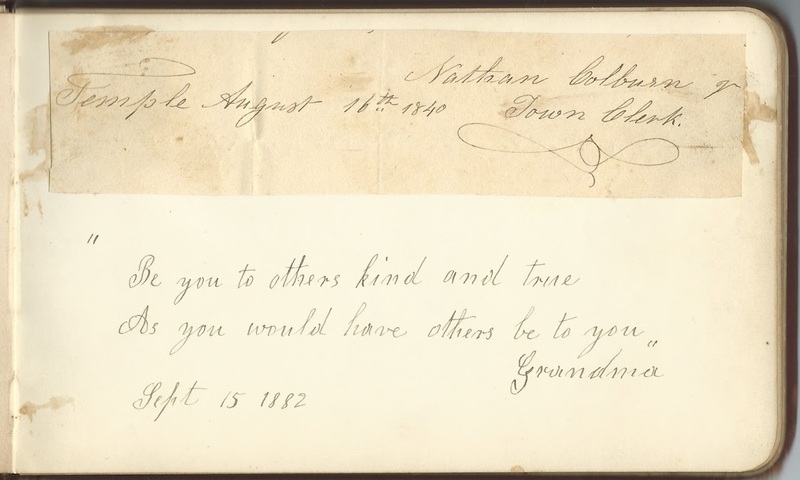 To make the page more meaningful for her grandson, though, Jane pasted a scrap of a document that Nathan Colburn had signed in 1840 in his position as Town Clerk of Temple, New Hampshire. Refer to the list below for the names of other signers who expressed a family relationship with Henry, blood relatives and in-laws. These include people with the surnames Brewer; Colburn; Edwards; Frost; Hildreth; and possibly Prutzman, and there may be more. On November 5, 1907 at Westford, Massachusetts, Henry Willis Hildreth married Harriet Craven Sargent, daughter of Frederick G. Sargent and Hepzibah (Craven) Sargent. Harriet was born February 25, 1881 at Westford, Massachusetts. They lived at Winchester, Massachusetts; Henry worked at a bank. If you have corrections and/or additions to the information above, or information on any of the signers listed below, or if I've made an error in family relationships, please leave a comment or contact me directly. Ella G. Brewer of Cambridge, Massachusetts, signed on April 7, 1883. Daughter of Thomas H. Brewer and Mary Jane (Colburn) Brewer, who was a sister to Henry's mother Lucy Maria (Colburn) Hildreth. Thomas H. Brewer, Jr., signed at Cambridge, Massachusetts, on January 5, 1882. "Your Cousin". His mother, Mary Jane (Colburn) Brewer, was a sister to Henry's mother Lucy Maria (Colburn) Hildreth. Scrap of an 1840 document with the signature of Town Clerk Nathan Colburn on it. Pasted on a page shared with the autograph of "Grandma", left on September 15, 1882. They were the maternal grandparents of album owner Henry Willis Hildreth. Nathan had died in January 1882, so the scrap was his wife Jane (Parker) Colburn's way of including him. Charlie L. Colburn of Temple, New Hampshire, signed on September 16, 1882. Son of Charles N. Coburn, a brother to Henry's mother Lucy Maria (Colburn) Hildreth. Lill B. Edwards, signed at Temple, New Hampshire, on January 10, 1882 "Your Aunt"
Fannie C. Frost of Cambridge, Massachusetts, signed on April 3, 1882. Frances Colburn (Brewer) Frost was the daughter of Mary Jane (Colburn) Brewer, a sister to Henry's mother Lucy Maria (Colburn) Hildreth. Her husband Clarence B. Frost signed the right facing page. C. B. Frost of Cambridge, Massachusetts, signed on April 3, 1882. He was Clarence B. Frost, whose wife Fanny C. (Brewer) Frost signed the left facing page. M. Hastings of New Ipswich, New Hampshire, signed on February 2, 1886. Middle initial could be C or G. If C, the signer could have been Martha C. Hastings, wife of Leonard W. Hastings. 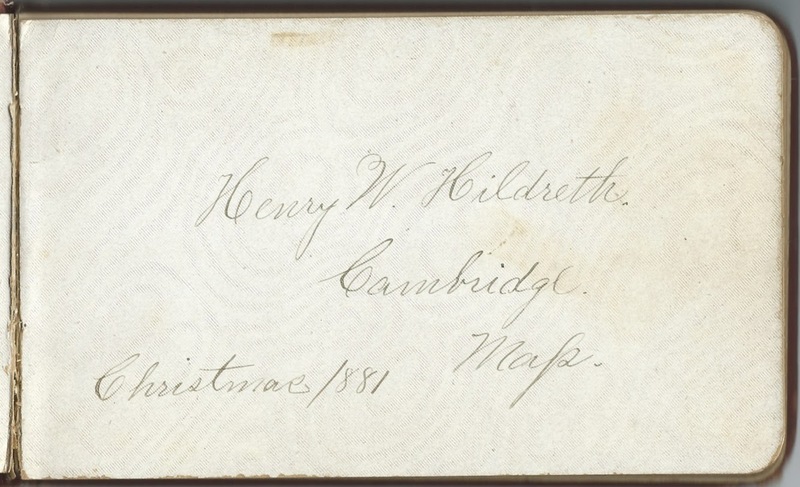 Henry W. Hildreth of Cambridge, Massachusetts, signed at Christmas in 1881. Album owner Henry Willis Hildreth. Charles W. Hildreth of Cambridge, Massachusetts, signed on February 14, 1882. Charles Willis Hildreth, Henry's father. His wife Lucy Marie (Colburn) Hildreth signed the right facing page. "Your Mother" Lucy M. Hildreth, signed at Cambridge, Massachusetts, on January 5, 1882. Lucy Maria (Colburn) Hildreth; her husband, Charles Willis Hildreth, signed the left facing page. Achsah B. Hildreth, signed at Cambridge, Massachusetts, on September 15, 1882. Achsah Beulah (Colburn) Hildreth was the wife of John Lewis Hildreth, a brother to Charles Willis Hildreth, Henry's father. She was also the sister of Lucy Maria (Colburn) Hildreth. Ella F. Hildreth, signed on January 1, 1882. Ella's father, Charles Lewis Hildreth, was a brother to Henry's paternal grandfather, John Lewis Hildreth, and thus Henry's 1st cousin, once removed. Florence J. Hildreth of Newton Upper Falls, Massachusetts, signed on November 7, 1886. Florence Josephine Hildreth was the daughter of William Hartwell Hildreth, a brother to Henry's father Charles Willis Hildreth. Therefore, Florence and Henry were first cousins. W. H. Hildreth of Newton, Massachusetts, signed on February 23, 1885. Perhaps William Hartwell Hildreth, a brother to Henry's father Charles Willis Hildreth. John L. Hildreth, Jr., of Cambridge, Massachusetts, signed on February 18, 1882. Double cousin of Henry, as his father John Lewis Hildreth was Henry's father's brother, and his mother Achsah Beulah Colburn was Henry's mother's sister. Beulah G. Hildreth of Cambridge, Massachusetts, signed on November 7, 1886. Beulah Gertrude Hildreth, double cousin of Henry, as her father John Lewis Hildreth was Henry's father's brother, and her mother Achsah Beulah Colburn was Henry's mother's sister. H. Augusta Hildreth of New Ipswich, New Hampshire, signed on February 18, 1882. Harriet Augusta Hildreth, a sister to Henry's father Charles Willis Hildreth. Lizzie Lincoln of Southborough, Massachusetts. signed on December 15, 1894. A. C. Prutzman, Jr. of Three Rivers, Michigan. Abraham Clifford Prutzman, Jr. (1847-1925). His wife Laura (Davis) Prutzman signed the right facing page. Mrs. A. C. Prutzman, Jr., signed at Cambridge, Massachusetts, on January 16, 1882. Laura (Davis) Prutzman, originally of New Hampshire, wife of Abraham Clifford Prutzman, who signed the left facing page. J. C. Richmond, signed at North Cambridge, Massachusetts, on December 25, 1882. "Age 80". Perhaps John C. Richmond. Mrs. Sarah Smith, signed at Cambridge, Massachusetts; middle initial might be F.